Google has changed the world. The company has given regular people all over the world the ability to find out what they want to know just with a few taps of their keyboard. But now it’s gotten even cooler. Now, you can find out everything you would want to know using just your voice. The kids love to ask Google silly questions but we adults love how it can be useful in our daily routines. Move over, Alexa, because now its Google Home vs Google Home Mini. To cut right to the chase, we’re recommending the Google Home Mini. But why, you ask? Well, to put things quite simply, the Google Home Mini does everything that the Google Home does – but for a smaller price. The only thing you get out of the larger version is a larger speaker but we all know we already have a few speaker options around the house already. Not only that, the Mini, like you would imagine, is smaller in stature so it can be put in more places in your home without being distracting to the rest of your home’s décor. So, we’re going with the Google Home Mini because who doesn’t love saving a few bucks and getting almost the same thing? No buttons, no remotes, no on or off switches. The Google Home is always ready to go when you call upon it. Enjoy hands free, constantly prepared activation simply by the sound of your own voice. Just say “Okay, Google…” and Google’s virtual assistant will begin listening to your request. Additionally, we found our Google Home could still hear us with music playing using its state-of-the-art microphones. How many times a day do you find yourself saying “Eh, I’ll just Google it?” At least two or three. Now, you won’t even have to go find your phone or head over to your computer desk to have your questions answered. If you want to know how much an elephant weighs, just say “Okay, Google, how much does an elephant weigh?” and the Google Assistant will tell you. Of course, the Google Home does much more than this but it is certainly an advantage that the Google Assistant has over Amazon’s Alexa. The Google Home goes beyond searching the web, though. You can set it to work with your schedule, know your commute, and so much more so that your Google Home really becomes your own. It even has the ability to recognize different voices so the kids can ask for their playlists just as easily as mom and dad can. With compatible devices, the Google Home can be used as a smart home hub to control other gadgets. With the right equipment, you can flip the switches on lights, control thermostats, and change the TV channel using just your voice. This really adds to the overall value of this tech by creating an interaction point with the rest of your home. We love turning the lights off when we are already cozied up in bed. The Google Home Mini may be small but it is mighty. We were surprised by how well the device filled up the room with sound despite the fact that it is the smaller version of the Google Home by physical size. The sound is clear, loud when you want it to be, and you can even get to Google Play with just your voice for a whole library of music (if you have a subscription). As we just mentioned, the actual size of this smart home appliance is actually a major benefit of it. Since it doesn’t sacrifice anything on sound, letting it be a small item makes it fit discreetly into any number of places in our living room. We could see ourselves taking it to a nightstand, putting it in the kitchen, or putting it on a shelf and being there when we want to use it but out of the way of everything else. Once you’ve got the Google Home Mini hooked up to your phone via Bluetooth, you can use it to make calls to friends and family. We found this awesome when we were doing something already but still wanted to have a chat with others. Or, perhaps, it could be used to answer those people who love to drone on and on and keep you from doing the other stuff you want to do in your day. Now, you can make everyone happy! 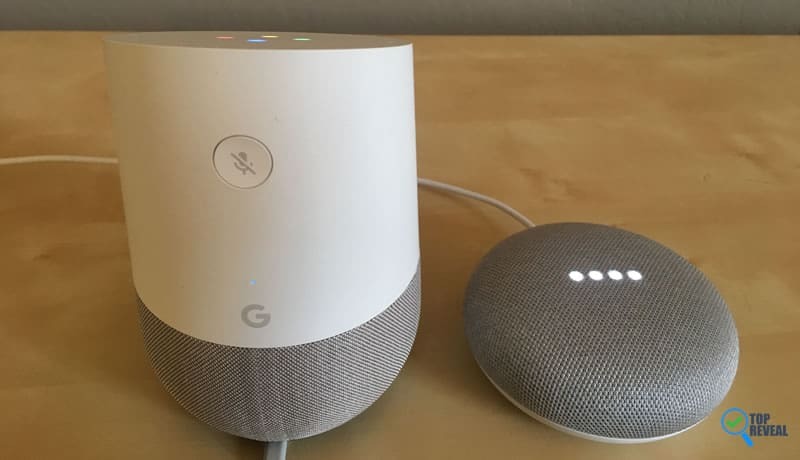 Now, to be truthful, there is a lot in the Google Home vs Google Home Mini comparison that says these two devices are similar. The big reason for this is that both of them access Google Assistant to complete their tasks. For this reason, the questions you ask, the calls you make, and the smart home controls that you request all get sent to the same spot and answered in the same way. While this is an interesting point, though, we’re not saying it’s a drawback on these machines. Rather, it’s a strength because the Google Assistant is just plain awesome. You’ll find that it does everything you need it to and more just like we did. Perhaps the most obvious difference is the actual size of these Google smart home gadgets. The Google Home is larger at 6 inches tall and 4 inches around while the Google Home Mini is 2 inches tall and 4 inches around. Most importantly, this means that the Google Home has a larger speaker than the Mini so it may be able to get some better bass than its smaller counterpart. So, really, it is up to you. Do you want the “small, out of the way” option in the Google Home or the “even more compact, definitely won’t get noticed in a corner” version in the Google Home Mini? Of course, the price of something must always be an important consideration. In this case, you’ll find that the Mini is indeed cheaper with a retail price of $50. The Google Home has a retail price of $130. For those who want better boom out of their speakers and a larger device to stand out in their home, the higher price tag just may be worth it. But for those who are only seeking an option to get to Google Assistant, paying less is probably a great idea. For this reason, your money may tell you that the Google Home Mini is a better option just by this factor alone. The Google Home has one HUGE advantage over the Mini in one way: It has Chromecast built into it. Chromecast is a device that is used to give you access to Netflix, YouTube, Hulu, the Google Play Store, and just about any other kind of content that can be pulled up on a Chrome browser on your home computer. That means that you’ll be able to control your TV using your Google Home, something that you just can’t say you can do with the Mini. We were extremely impressed with this ability when we said “Okay, Google, put Stranger Things on the TV” and boom, we were all plugged in with our popcorn just like that. Here’s the thing: If it’s a smart home you desire, it would be a mistake to leave out a piece of technology that can access any information on the web at any time – and using only your voice. These two Google Home products are really the only ones that can say that they can do this when it comes to smart home virtual assistant tech. That makes them leaders in the field so that things really shake out to be Google Home vs Google Home Mini. We love them and we know that you will, too!